Is it Time to Sell Tesco? Tesco is the largest supermarket in the UK with over 2,000 stores here and around half a million staff worldwide. It’s a monster. It’s the dominant player in a recession-proof industry and has Warren Buffett on board as a major investor. So if the Christmas results for a single year were a bit disappointing, investors would just shrug it off… right? As is so often the case the short-term market players have the power, at least in the short term. With so many retailers struggling and more falling by the wayside every day, even the slightest bit of bad news seems to have massive repercussions regardless of who they relate to. Was Buffett wrong to invest in Tesco? That’s not quite as miserable for long term shareholders as some other companies, but we are still back at prices seen previously in 2005, some 6 or 7 years ago. Investors over the last few years may be a bit disappointed (except those that bought in the depths of the credit crunch), but what about now? 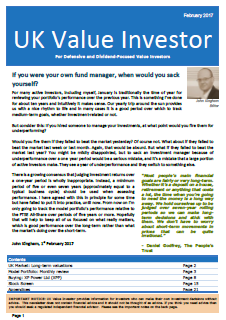 How does the investment case stack up from the point of view of an ‘average’ investor? For this type of company I use a 6-step process for the initial review, which is an extension of the principles outlined by Ben Graham for what he called ‘defensive’ investors, who were typically people building or living off of a retirement fund. Risk management is important for defensive investors, hence the name. 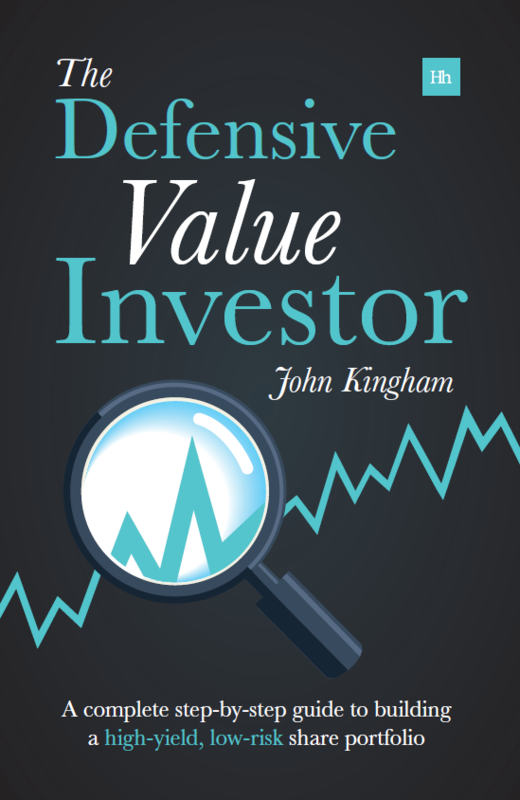 Ben Graham suggested three main steps to check that an investment has sufficient defensive qualities. If you already recognise that Tesco is a pretty indestructible company, feel free to skip on ahead to the ‘pay a low price’ section below. This primarily relates to holding a sufficient number of companies in a wide range of unrelated industries, but it also applies to the individual companies themselves. There are many ways that a company can be diverse and for Tesco it comes primarily from operating in many different locations, both within the UK and internationally. If a particular store or geographic region performs badly because of local issues, the rest of the company should be relatively unaffected. Graham felt that the defensive (retirement fund generating) investor should focus on successful companies. He gave them various names, but typically he used words like large, leading, prosperous and prominent. The thread that ties all these terms together is long term success. In Tesco’s case it has been growing profitably for at least the last 10 years and has increased revenue, earnings and dividends on a per share basis in every single one of those years. That’s pretty amazing. Debt is a corrosive substance. As Warren Buffett has said, “Leverage is the only way a smart guy can go broke”. For a defensive investor there is no reason to take the risks that come with highly leveraged companies. Fortunately, Tesco seems to have an aversion to excessive debt even though they are in a very stable industry and could probably borrow far more than they currently do. The interest payments are covered around 11 times by earnings and total borrowings are only about 3 times operating profits. Both of those figures are relatively conservative and in no way excessive. So far Tesco ticks all the preliminary boxes for a safety first, defensive holding; but what about excess returns? Surely the whole point of stock picking is to beat the market in the long run? Indeed it is, so let’s turn from Defence to Value. Price is what you pay and value is what you get, as many have said. The value that you get from an investment can be broken down into 3 main parts and these are steps 4 to 6 in the initial analysis phase. The future is uncertain, but some companies have already proven that they are capable of generating a certain magnitude of earnings. Companies that have generated consistent and unbroken profits for many years are more likely to continue to generate a similar level of profit than those that have not. One way to measure this earnings power is by using the 10 year average of historic earnings. This number provides a baseline figure that may be a reasonable expectation for future earnings. As an investor it would make sense to get as much of this earnings power as possible for each pound invested and so a key metric is the PE10 ratio, or the current price relative to the 10 year earnings average. For this ratio, a lower value is better and currently the FTSE 100 index has a PE10 figure of around 13.9 (with the index at 5,690). For Tesco the PE10 is 14, so it’s almost identical to the index that most investors are trying to beat. Most investors focus on capital gains as that is where the action is. Price swings of 5 or 10 percent in a single day have an amazing ability to focus the mind. Generally though, this is a mistake. Many studies have shown that the dominant factor in long term returns is reinvested dividend income and so a high yield combined with a sustainable dividend are likely to be far more important than the gyrations of the stock market. The FTSE 100 currently offers something like a 3.5% yield which history shows is probably as sustainable a dividend income as there is. The chances of the dividend being stopped or even just cut are slim. On top of that the dividend is likely to continue growing at something like the historic rate of 5% or so. 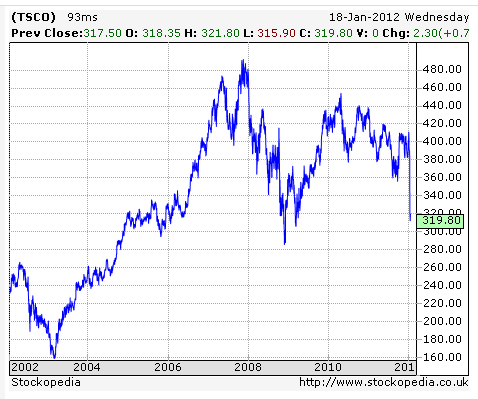 Tesco, on the other hand, currently offers investors a dividend yield of around 4.9%, almost 1.5% clear of the index. While that may not sound like much, it is true that every little helps. What may be more important is the possible future growth rate of that dividend. As the results table above showed, Tesco has grown in every one of the last 10 years. The growth rate of earnings is around 10% a year which is comfortably above the market’s growth rate of around 5% a year. This growth rate, plus the fact that they retain around 60% of earnings means that they are generating something like a 19% return on retained earnings, which is pretty solid. Given that we already know that the PE10 is about the same as the market’s at 14, it’s unlikely that the current price could be considered ‘overpaying’ for Tesco. Sadly the future returns are completely unknowable. But, it is possible to say something simple about what they could be. With a dividend yield of about 5% and a growth rate of around 10%, if we assume that the PE ratio stays where it is then future total returns over a period of years may be in the region of 15% a year which is more than reasonable. If the share price refuses to budge back up towards 400p then you’d have a share that yields 5% with a yield growing at close to 10% a year. In 5 years the yield would be close to 7.5% if the share price stayed flat. So you either have Tesco with a growing share price giving a 15% return per year, or a Tesco with a flat share price yielding 10% more every year. Either way, that sounds pretty attractive. In direct comparison to the FTSE 100, the price (PE10) you’d pay for Tesco is about the same, but both the current dividend yield and the historic growth rate are considerably higher. For investors looking to beat the market with a diversified portfolio of leading companies I think Tesco should definitely be on the short-list. P.S. You may have noticed that I didn’t analyse the current bad news surrounding the poor like-for-like Christmas sales figures. Those kinds of minor bumps in the road will typically have next to zero impact on the long term intrinsic value of a company like Tesco. The only time you should care about that kind of news-fluff is when they create fantastic buying opportunities. Buffett has been buying more. He owns just under 5% of the issued share capital now. Hi Marcel. I just saw that a few minutes ago! At least I managed to post this article at about 11am which is just before any news articles that I can find which mention his new purchase. I think Buffet reads this blog and took my advice. Glad to see your follow up to M&S as discussed. I doubled up on TSCO at about 316p a few days ago. It felt slightly brave at the time, but now Warren B has done the same I feel a muppet for not buying more! Hi M. I feel kind of left out of all the fun with all those comments here about buying Tesco. It’s not quite my top rated stock and also I’m not in my trading ‘window’ (1st week of month) so my hands are tied. I know that might make me sound like I’m restricted by a prison of my own making (if that’s the right metaphor) but I think the benefits of a fixed system outweigh the enjoyment of being able to invest on the spur of the moment (which is likely to give me more trouble than profits!). If the price stays low for a few months I’ll probably be joining you in due course though. Is it time to sell? I hope not, I have just bought in the past week for my income portfolio. Good solid company with worldwide operations; P/E under 10 and dividend of nearly 5%. I think Buffett knows a bargain! Hi John, I’m with you and Buffett on this one. I thought the drop in share price was one of the best examples of short-termism that we’ve seem for a while. No wonder Buffett (and you!) jumped at the chance to buy more. While it’s not quite top of my short-list it’s pretty close and if the price stays around this level (which it might not now that Buffett has been seen buying again) for a few months I might just buy in myself. I certainly hope you’re right, as I bought some TSCO off of the back of the latest goings-on. I still find it difficult to believe that a company like Tesco could fall 16% in the day off the back of a 1.5% fall in LFL in the UK. HMV, maybe, but not TSCO. I’m hoping for a quick quid out of these (do I have to hand in my Value Investor badge?) – but on reflection I’ll probably hold onto them for awhile because of the nice divvie. I suspect a sharper operator would make a quicker turn than that. I think it’ll probably get a good bounce now that Buffett is publicly backing it again. As for the ‘news-fluff’ comment, you’re right about HMV. If you’re playing the Buffett game and picking economic fortresses then bumps in the road are opportunities. But if you’re smoking cigar butts then those same bumps can be very dangerous. Good luck with your Tesco flip. Ups, Tesco again on the agenda. And people buy it because Warren buy it. Fair enough. One thing I learned investing, when there is a profit warning there are a few still to come. The problem with Tesco is its incompetent management. If Warren manage to change it and bring in a smart CEO in there will be plenty of upside. But I don’t think he will do it right now, he wants to have more Tesco stock and in the meantime Tesco shares will go sideways and Warren will buy some more. One day, Warren will change the management but he is not in a hurry. Are you prepare to wait and have the money to buy more stocks like him. I believe Warren likes this game, he buys, peope jump and buy. Tesco brings a profit warning, people sell in a hurry, Warren buys some more. Yes, Warren will jump in at one moment (he may even take Tesco private to make a better use of its free cash flow) but he does that only when he has enough stock to make it worthwhile.